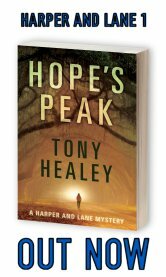 Tony Healey is the bestselling author of Hope’s Peak, the first book in his Harper and Lane series. It was the 20th bestselling novel of 2016 on Amazon and had over a quarter of a million readers. 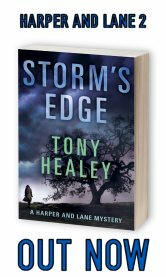 The sequel, Storm’s Edge, released the 10th October, 2017. Both are published by Thomas and Mercer. Tony’s fiction has appeared alongside such award-winning authors as Alan Dean Foster and Harlan Ellison. He lives with his wife and four daughters in Sussex, England, and is at work on his next novel. He is represented by his agent Sharon Pelletier, of Dystel, Goderich & Bourret Literary Management, New York. The Rising Fire ? When is it due out. ? I might have some news on that next year. It *will* happen. Watch this space.